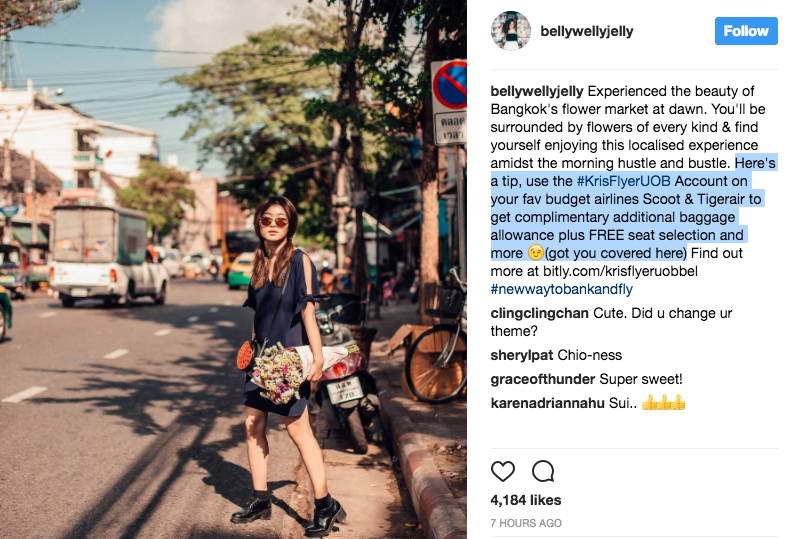 SG Budget Babe: Krisflyer UOB Influencers' Campaign Reeks of Dishonesty? 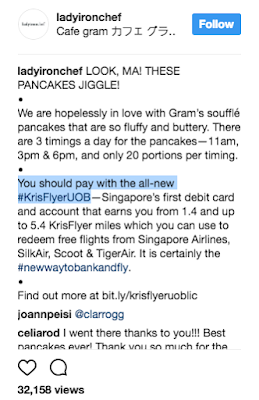 Krisflyer UOB Influencers' Campaign Reeks of Dishonesty? If I were to believe what all the influencers on the #KrisFlyerUOB campaign said, I'd think the account and debit card is a wonderful deal. Except that it is not. Now, here's where it gets interesting. I personally thought it was a terrible product, but apparently all these (realllllllly popular) influencers don't seem to share my views. In fact, they had nothing but praises for it! I'll upload my analysis of the account in a separate post, but that's not why I'm here today. I'm here because I felt the way this whole marketing campaign was executed was just downright misleading, and that's not good. Neither am I the only one who feels this way - check out what my friend Aaron has to say about their posts too. 1. 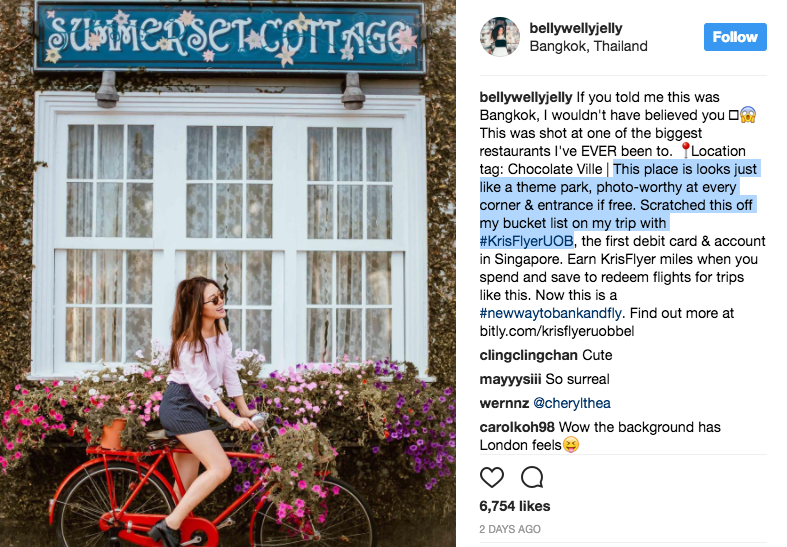 Shouldn't influencers at least try to first understand the product they're promoting? Is that 1.4 miles per dollar spent? Or for every 1 cent that I spend? Now THAT will be a real game changer! If that's the case, I most certainly should be paying with #KrisFlyerUOB! 2. It sounds like they're implying they've unlocked their trips from the #KrisFlyerUOB account, but that is IMPOSSIBLE. Given that the account was literally just launched a few days ago and that any miles earned will only get credited at the end of the month (the T&Cs here), how on earth did these influencers manage to do that?! Did they already spend $18k and $60k respectively AND somehow found a way to get their miles even before the account was launched? Maybe they asked the guys at UOB to credit into their account early so they can exchange for their trips in order to get this unbiased review out in April? 3. Did they forget to declare it as sponsored? 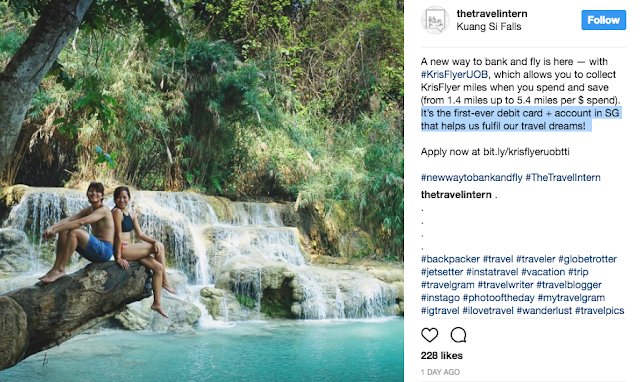 "As none of them tagged their posts as #sp, #sponsored, #ad or #advertorial, we can then assume that they are all unbiased reviews based on the influencers' own experience with the account." Right? Even if a blogger is writing his genuine thoughts about a product or service provided by a company he has a commercial relationship with, he should declare the relationship in the post. Update: Now that people are calling out on their bluff, bellywellyjelly has added the #ad hashtag to her #KrisFlyerUOB posts. Why wasn't this done earlier? 4. If they are indeed "content creators", how come these influencers all seem to be doing a "cut-and-paste" job when they wrote about #KrisFlyerUOB? - "You should pay with the KrisFlyer UOB..."
- "Spend and save with KrisFlyer UOB..."
- "Unlock free trips like this (easily)..."
5. 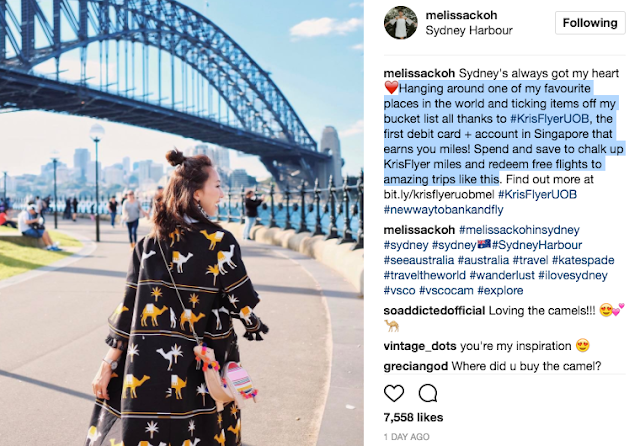 Do Influencers Influence? What if they've misled their audiences? Spiderman once said, "With great power comes great responsibility." I think the basic responsibility of all influencers who accept paid postings is to at least be honest and get their facts right. Now let's give Christabel the benefit of the doubt and assume she'll never give a BAD tip to any of her readers, especially since she says she's got us covered. - The complimentary extra baggage...comes only after you first pay for 20kg in your booking. You'll then get just 5kg extra, which is even less than the hand-carry limit. - The FREE (in caps, no less) seat selection...sounds good too, except that I have to still pay for the rest of my family travelling with me. Are you crazy?! Sit separately from my husband and friends on the flight?! No way! I'm clingy like that. Unlock trips like this with #KrisFlyerUOB! Unlock trips like this! Unlock, unlock, unlock! 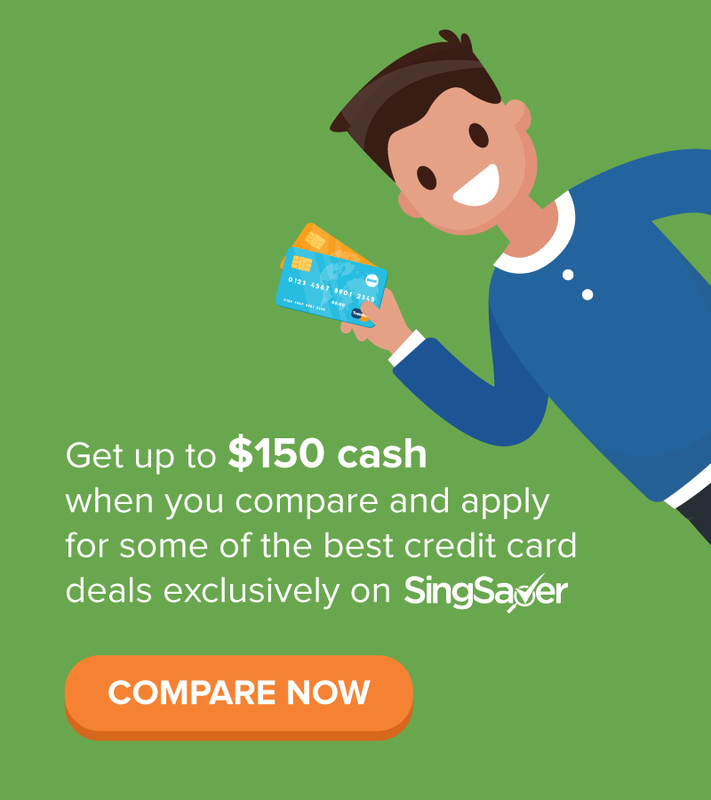 They describe it as a "piece of cake" and that it is "easy", but they forgot to tell us that you'll have to first spend $18k - $60k if you want to "unlock" their trips. $60,000 to chalk up enough miles for Mel's Sydney!!!!!! Maybe it is a "piece of cake" for them, but it isn't for the rest of us who aren't sponsored and don't earn as much income. 6. 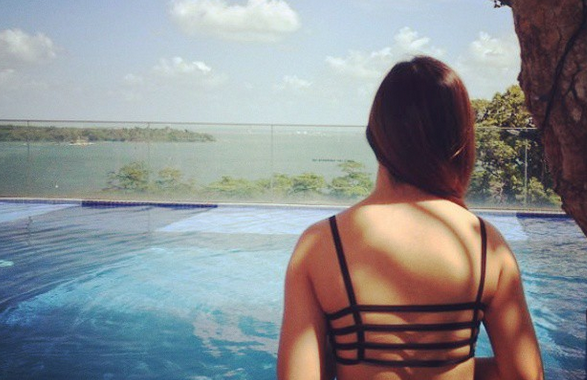 What do influencers really mean when they say they're "genuine" and "true to" themselves? Hear it from Melissackoh, who calls herself a "content curator" and asserts that she does it "not for money...because I had a genuine desire to construct content that would move and inspire people in powerful ways". She also claims that she left banking knowing that she could draw a comparable income from blogging. As a blogger myself, I don't see how the content on this whole #KrisFlyerUOB campaign was curated by them at all. What I see instead are people who didn't bother to properly understand the product, didn't read the T&Cs, didn't bother to check whether the #KrisFlyerUOB account is truly a good deal before they promoted it to their massive throngs of followers. And since they do acknowledge that their content has the power to influence people, wouldn't they have misled their readers into thinking this was a good deal? I don't know about all their other followers, but when I saw it on their pages, I did think it was. That is, until I checked out the facts. Bel's follower is saying "yes" to #KrisFlyerUOB too. Influenced? 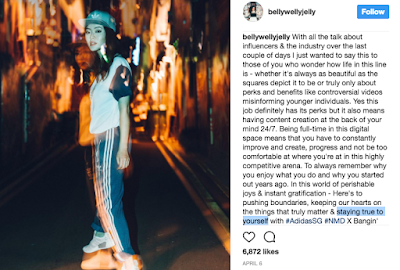 What does it really mean to "stay true to yourself" as an influencer? Is it to charge brands a high fee, then take our clients' money and write posts like these? I'll put it out in the open that I've written sponsored posts too, which are 100% authentically me. Read what I had to say about the UOB One account and POSB CashBack initiative here. But I only accept products I genuinely think are good. I'm not afraid to reject the ones I think aren't. I say it as it is. I check my facts. I dig and ask all the hard questions (ask my clients!) before I post my review. That is what I believe means to be "staying true" to myself. Oh, and neither did I add the sponsored disclaimer only after people called me out on it. Just check the Google Cached version and you'll know. Another local influencer, with close to 45,000 followers, recently emailed me to say she didn't intentionally mislead her readers to think of me as a scrooge or a miser, just because I wrote a piece on how to save more money by going on a financial fast. Weird, because I didn't even say she called me that. Was she staying true to herself when she wrote that? I can't be sure either, because she has since taken down the paragraphs which I felt insulted by. A few readers have asked for my opinion of the KrisFlyer UOB account, so here it is : No, I will not be signing up for the KrisFlyer UOB account. 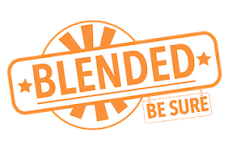 There are so much more better alternatives out there. I'll upload my analysis on the account tomorrow (I'm just waiting for Aaron from MileLion.com to send me his miles-hacking strategies, which are infinitely better than this #KrisFlyerUOB). Remember to not just take what you see on the Internet at face value guys. Thanks to these people, I've now learnt that I can't just trust what influencers say anymore. You are one of the best and truthful bloggers in the blogosphere around. I think these things are always grey and can never be appropriately addressed. There are many marketing and obviously a "not so good" product needs even more marketing avenue to market its product to succeed. 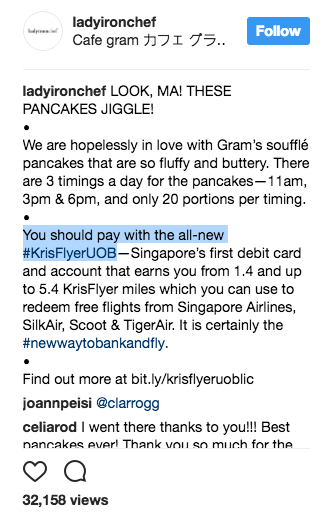 Like you, I personally do not see the UOB debit card krisflyer as being the best product out there, but I do think it's not THAT bad to begin with. Some of the information could have been better phrased so not to mislead readers but marketing do need to highlight the good more than the bad unfortunately. It's just the way we live in this world. Agreed! Marketing is a skill - it is all about how you write and present a product, and to do a good job, you really need to first get to know the product from inside out. A short-cut will never work, in the worst case scenario, it'll only backfire and waste all that marketing money. But when influencers get paid so much and don't even do the basic homework to truly understanding the product they're promoting, that just speaks a lot about their ethics. And perhaps that of the industry too, if more influencers continue to do it without any repercussions. I don't think the KrisFlyerUOB is bad per se. But in contrast to the other options out there, especially the ones Aaron and I highlighted? Then yes, it is relatively terrible. I wonder what all the customers who deposited their money into KrisFlyerUOB earlier feel now when they see all these exposes? Will they withdraw their money? Hmmm. If they do, I'll tell them to put into the UOB One account. Same bank, better product. Also one that I was sponsored to review on LOL. Hello Kevin! Haven't seen you in a while! I love MileLion too! He's like the best site for miles information man. Great perspective on how influencers keep sugarcoating or ignoring the expenses requirements completely!! This is an honest and great post calling out the influencers. 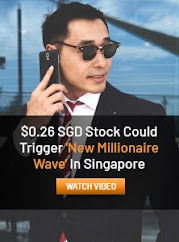 In any case, this is a terrible product from UOB and it's good that MileLion and you broke it down to show why that's the case. Well done! Thank you! I was wondering why none of you guys commented (on your own blogs) earlier about this whole marketing saga! This article doesn't really say why it is not a good product. You just saying it is misrepresented by people. Can highlight why this card is bad compared with citi premier miles or something ? Hi AI, it is in the second last para up there before I signed off: "I'll upload my analysis on the account tomorrow (I'm just waiting for Aaron from MileLion.com to send me his miles-hacking strategies, which are infinitely better than this #KrisFlyerUOB)." I have always liked how you are neutral in doing product reviews and penning your thoughts here. Even if it is a sponsored post, shouldn't the minimum requirement is to always state a disclaimer paragraph that it is sponsored? Great job to both yourself and milelion for being honest in reviewing this Krisflyer UOB product. Thank you! I LOVE the way MileLion phrased it. Sometimes I'm too serious. Need to pick up self-deprecating humour skills. Deleting all spam. Spam bots, stay away or suffer the same fate lol.